I started cycling for commutes in December 2017, my first BRM was in May 2018, after a couple of twists I decided to attempt the BRM 600, and also take a shot at the Super Randonneur (SR) title. You can read my stories on the BRM 200, BRM 400 and the BRM 300 here. After the multiple strings of injuries that I suffered, Deccan Nadh Khulla, the flagship 600 BRM of Pune Randonneurs came up. Scheduled for 29 September 2018, it was also the last BRM of the season from Pune for the calendar season 2017-2018. The fresh IT band injury and a patella tendon injury post the BRM 300 were both severe. I had around 4 weeks to recover. I planned my recovery with rest, icing, stretches and strength training. Unfortunately, the IT band was really tight. I planned a few climb training rides and could feel the tightness in the IT band during each of these training rides. I knew about this injury and sat on the fence until the very last moment. Decided to go ahead with the ride, with nothing much to lose. Made up my mind to use low gears. I planned to only use the smaller chainring, 34 and go high cadence to conserve energy as well as avoid any new injuries. Looking at slower speeds with a small chainring and hence decided to let Mayur go ahead with another team so that he could maintain his good average speed. I decided to tackle the Brm 600 alone. The route for the Deccan Nadh Khulla BRM 600 is Pune to Kagal back to Pune then to Lonavala and back to Pune to finish at CCD Chandani Chowk. 600 km in 40 hours. Knowing that there was a night halt arrangement made at Satara at 379 km mark, I had to really manage my breaks well. For this, I had to really plan my nutrition really well. The target was to avoid taking a breakfast or lunch break. I stocked up on sweet buns, cheese cubes, some snickers, and some chikki. Also being out in the heat and sun for two days I knew we would need good hydration and salts. Stocked up on ORS packets. I packed a bag with changeover riding gear, an extra pair of shoes and some things to eat. This bag was supposed to be dropped by the BRM organizers at Satara. I managed to get in 6 hours of sleep for the first time before a long ride. Woke up at 3:30 am with an aim to leave by 4:30 am. I was really anxious before a long ride, also a very first. I sipped on my black coffee and rechecked the gear and cycle once again. Checked air pressure again and set it to 110 PSI as per the recommendation of Bipin. Had a banana and two boiled eggs. Ended up starting at 5 am with two bags. Managed to reach Pune university by 5:30 am. Was greeted by Hanoz, Amit Lele and Rao. The place was teeming with riders, almost 44 riders for 600 and 35 odd for 200. Quickly got the bike check done and the Brevet card. We got flagged off at 6 am sharp. Mayur took off as usual. With a focus on riding easy, I started the ride. It was a lonely ride to Chandani chowk climb. As soon as I hit the highway, Koken crossed me. We exchanged pleasantries and I wished him good luck. As I climbed to the new Katraj tunnel, I took a small 2-minute break to eat a banana. Mayur it seemed was on a song today, and I was definitely slow. Started riding again and continued up till Shirwal. Around 60+km’s, time was 8:20 am. I was roughly 5 minutes later than our earlier 2 times at this point. The average was around 26 kmph. Mayur was not here either. It seemed that he had gone break less today. I quickly ordered a cup of tea, filled up water, had a sweet bun and a cheese cube. Wrapped up the break in 6 minutes and I was back on the saddle. I started climbing up Kambhakti soon. Looked around and saw no one. The climb felt much easier today, core was good, the gear shifting was smooth and I was riding easy, managed to still be 2 seconds more than the last effort. Climbing alone and not a rider in sight, I decided to call and check on Mayur after the first part of Kambhatki. It seemed he was navigating the final climb when I was starting the climb. Reached the top in scorching heat. Took a 3-minute break to stretch my IT band. I could feel some discomfort. Quickly had another sweet bun. Was another lonely ride in the heat and sun up till the first CP at Nagewadi. Picked up a packet of Enerzal, filled up water, some stretches and a banana later I started again. A break of fewer than 10 minutes. 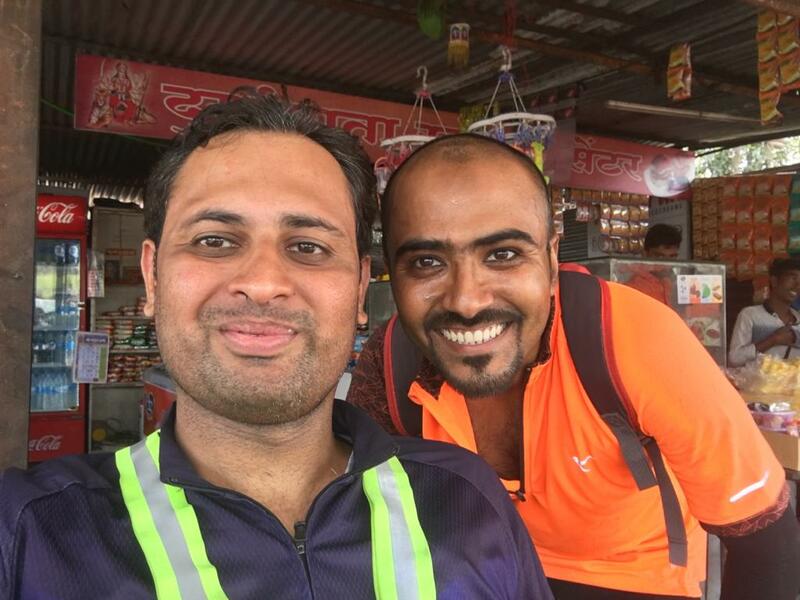 Reached CP at 10:20 am, 107 km, average around 26 kmph. Started again at 10:30 am. I had a plan to cover 100 km in 5 hours inclusive of breaks. At this point, I had a lead of over 40 minutes. For the first time, I had checked into the CP and left alone. Reached Satara and the heat was again killing. The small rolling climbs of Satara did not help either. Right after tackled two flyovers out of the five, my phone rang. Mayur had stopped post the rolling climbs for a cold drink break and he was leaving. I still had three climbs to tackle and the IT band was in slight discomfort. I took it slow. Managed to complete the final climb, and stopped under whatever shade I could manage. Grabbed a banana, one piece of bun and some water. Started the Khind decline and then into the easy flat till Umbraj. I could manage to hold some decent speed with some good cadence and I surged ahead. The only challenge was the heat. I also experienced some headwinds and crosswinds in this section and hence had to go down to the drops to conserve some energy. 10 km before Umbraj, I felt a loss of energy with the heat, saw a small cold drink shop and headed straight to it. Got a bottle of Thumbs Up and finished it in one gulp. I did not get down from the saddle and could wrap up this break within 2 minutes. Just as I crossed Umbraj, I received a call from Mayur again, he had reached the CP at Vardhe and was leaving. A quick discussion and I advised him to take the lunch break there as the chances of finding an eatery were slim until Kolhapur. He decided to cross the toll and wait at the small eatery. I reached the CP at 12:30 pm, 156 km, average hovering around 25.5 kmph. Filled up water, got the card signed and moved ahead to cross the toll. Mayur was extensively happy to see me, and so was I. I guess we were both bored of riding alone, and all our long rides were together after the Pandharpur trip. Mayur had got rice and ordered some curd. We quickly finished the rice, some bread and a bottle of Thumbs Up. Started again before 1 pm. This section was 90 odd km but would also be the toughest with the heat. Mayur and I started again. Crossed Karad soon and moved towards Peth Naka. 5 km after crossing Karad, the heat was getting to us. I saw Mayur waiting under the shade. Exhausted with the heat, we took a water break. 5 minutes and we decided to move ahead and stop at the first cold drink shop. Stopped again soon for some thumbs up and cold water. The ORS water with the heat was undrinkable. I emptied one bottle and filled it up with cold water. We crossed Sai International and calculated that we had roughly 60 km to go and decided to take another break at 30 km. Mayur was within my sight for about 5-6 km before the sky played games and a few large raindrops started falling. I stopped to put my mobile into the zip pouch and that was the last of Mayur I saw until Kolhapur. The heavens did not open their gates and it was still hot. I continued hoping to see Mayur on his break. Unfortunately, that was not the case. I crossed the Kini toll and still no sight of Mayur, thought I should take a break but then thought that I would see Mayur ahead. This was a big mistake, I should have taken a snack break. Moved ahead and started feeling the loss of energy, fished out a packet of chikki and finished it while riding. 2-3 km more and still riding slow and struggling, I stopped on a flyover, ate my last banana and stretched. Kolhapur from Pune side is a constant series of rolling climbs, something I was not aware of. Getting drained, I stopped again, had a piece of bread. Crossed Kolhapur and started looking for Hotel Jaihind Deluxe. Mayur called me up around 5 pm, he was at CP, I guess I still had around 2 kms to CP. Just as I searched my way to the CP, it started to pour. I was drenched in a minute and the muck from the road was all over me. Located the hotel and Mayur. CP3 at Kagal, hotel Jaihind deluxe was tackled by 5:12 pm, 11 hours 12 minutes and 246 km at 25.1 kmph. Because it was raining we decided to stop here and grab something to eat. We ordered a cup of tea and some egg bhurji with roti. While we were eating, we meet a biker. He was impressed by our ride and got chatting with us. A selfie later I was stretching and this guy tells me ‘dude you seem to be in pain, you can barely walk.’ I dismissed him saying that both my knees are injured and this limp might be because of muscle soreness. However, I myself had barely noticed any pain. We started back at 5:50 pm. Just as we were walking to cross the road I noticed that my rear flasher lights were not ready to switch on. Probably the rains had got to it. Though I had another spare, taking it out would mean wasting a few minutes. I called out to Mayur who was walking ahead. I decided to just take out the batteries and give it a shot and it started working again. Phew, that was some relief. Also got the headlight out and set up and we were moving again. No rains, but the roads were wet and we were picking up some good tyre splash. The weather was much cooler and pleasant, the sun was down and we were expecting it to get dark soon. The roads were pretty much downhill, but the wrong side traffic of bikes and cars were a big trouble. We moved ahead cautiously with Mayur in my visible range. Just as we approached the Kolhapur toll at Kini, some 25 km, it was dark and my light all of a sudden went off. No warning. I tried to press the button and it would stay on for 5 seconds and go off. Riding alone in the dark I decided to call Mayur to halt at the toll, which was around a kilometer ahead. For the next one km I was working with the lights being on for 5 seconds. Managed to reach the toll soon and replaced the batteries and realized how strong and bright the new light I had acquired was. We rode up to a small tea place some 5 kms before Peth Naka. High cadence, low gears, the weather was fantastic. Cool breeze, thunder, and lightning in the sky and we were rolling. Mayur rode right next to me in this section. We stopped for tea and some teekhi roti which Mayur had got. I was not ready to repeat the mistake I had done earlier and wanted to eat frequently. 10 minutes and we got rolling again. We hit Karad at around 9:15 p, 322 km mark. Decided to take the dinner halt, as we were unsure of getting any food post this place. Ended at a small place near the bus stop and ordered Dal rice and some lemon juice. The guy took his own sweet time to serve the food and Mayur and I was furious. Karad to Satara CP was around 57 km. We started at 9:50 pm from Karad and set a target of midnight to be at Satara CP. This stretch was very well known to both of us and was our 4th outing together. We started riding close again. Mayur taking some lead in some sections. The road was wet from rains in some places and we were again subjected to some muck from the road. 15kms from Satara CP, I started noticing that the pain in the right IT band was getting severe and I was not being able to ride fast. I started to lose sight of Mayur. I knew that I had to tackle the Khind climb before Satara. Forget the Khind climb, the small flyover climb before khind sucked all my energy. I could no longer ride off the saddle. I managed to slowly climb the khind climb and enter Satara. Decided to then avoid the 4 flyovers in Satara and take the service lane. Reached Satara CP at 12: 15 am. 379 kms. Speed had dropped slightly because of the last 15 km struggle, to read 24.8 kmph. Got the card signed and joined Mayur. I quickly went in for my bath as per plan. The plan was that I take a bath, then take a 15-minute nap while Mayur freshened up. However, I had changed the plan to rest the knee for a few hours and then take a decision if I should ride. Applied some Nizer gel and put the knee in a kneecap post some stretches. Asked Mayur to go ahead as I would try and rest the knee for 2 hours, get some sleep and then continue. Mayur protested but then agreed. I called up my wife and told her that I think I should quit and not continue as I would screw up the injury more. Mitali has always been the sensible person, she is a Physio as well as my best friend. She did not blink an eyelid before she said: “Anshu don’t give up, go ahead”. I was really surprised to hear this. Pumped and determined I went to bed that I would continue. 30 minutes down the line, I did not get any sleep. Damn, I was tired, back, legs everything was hurting and no sleep. I sprung up on my feet and told Mayur “Let’s go, buddy, we will see what happens”. I was not feeling too good about letting Mayur go out alone at this hour, so I thought why not give him company. 1:45 am we started again, our first major break of 90 minutes. I was feeling great after the rest and thought that the Nizer gel had done the job. I was very happy that I would be able to complete the ride. Mayur and I decided to take a small tea break at the toll, some 15 kms. However, my joy was short lived, within 6-7 kms my pain was back. The climb post-Satara had done me in again. Reached the toll and we had tea. I mentioned to Mayur that the pain was back. Few stretches and we started again. I noticed that I was feeling drowsy and sleepy now. Cursed me. I tried sleeping at the CP and no sleep and now I as drowsy on the ride. Mayur was trying to ride close to me, but my speeds had dropped massively. I could notice that I had no strength in my right leg and was pushing with my left. Mayur would stop at each flyover and wait for me, some places I stopped and stretched. In the next two hours, we covered 35 kms to reach Kambhatki tunnel base. We crossed over and looked for some red bull. No one had a red bull. Mayur ordered a Thumbs up and I decided to sleep for 10 minutes. But the last 2 hours struggle had helped me make up my mind. I did not want to hold up Mayur anymore. He could have easily done a sub 28 hours 600, but was being slowed down by me. I had already robbed him of a good timing during the 300 BRM earlier. I convinced him to move ahead. He left soon. I called up my wife and told her that I was going to quit. I would slowly ride until Pune and then quit from there. We both had a discussion and agreed that it was a continuous climb to Pune and I would only aggravate the injury if I ride. Decided to call up a friend to pick me up. Also posted in the BRM group that I was quitting the ride. Ordered some tea and breakfast as I had close to 2-3 hours before my friend would reach there. After the breakfast, I slowly made my way through the kambhatki tunnel to reach the other side. As I waited for my ride, Dr. Dhanraj sir and Dr. Adesh sir came, both of them encouraged me to continue the ride. Well, I had about 18 hours to ride 180 km, was definitely doable even if I took massive breaks. But then I had made up my mind that I would not aggravate my injury. I could feel my left knee become heavy with all the stress. I did not want to repeat my mistakes from the previous two rides. Dr. Chandrakant Harpale and his team also joined sometime later. My friend picked me up at around 7 pm and I was home later. My first DNF, the first ride back home in a car from a ride. 418.5 km in 22 hours, average 23.8 kmph. Mayur and everyone else struggled in the heat on day 2. Mayur was hit by fatigue and sleep and decided to take a power nap before he reached Pune. He finally managed a very respectable 31.15 600 BRM. Which is a massive figure for someone on their first 600 BRM. Mayur managed to get his first Super Randonneur, and I am super happy for him. My dreams for the SR would have to wait for the next season. For someone who started cycling in December 2017, and learned about BRM in March, attempted the first 200 in mid May, I think I managed to come a long way. Now it would be a proper rest and recovery for the IT band.